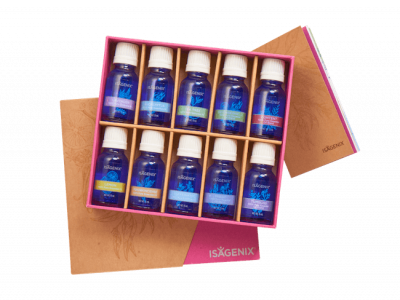 Clicking ‘Buy Now’ will direct you to the 100% secure Isagenix International website, where you will complete the purchase. Your order will be shipped fast and most orders arrive in 2-3 days. International orders outside of USA will be shipped from your local country of residence. Need help? Read our guide on How to Buy Isagenix here. Lemon Oil – With an unmistakable scent, lemon essential oil is ideal for diffusing if you are looking for a burst of uplifting energy. It also makes an excellent addition to natural cleaning products. Lavender Oil – This well-known, versatile oil has a popular, light floral scent that is notorious for its ability to help promote a sound night of sleep. It can also be applied topically to help calm irritated skin, reduce pain, and soothe tight muscles. 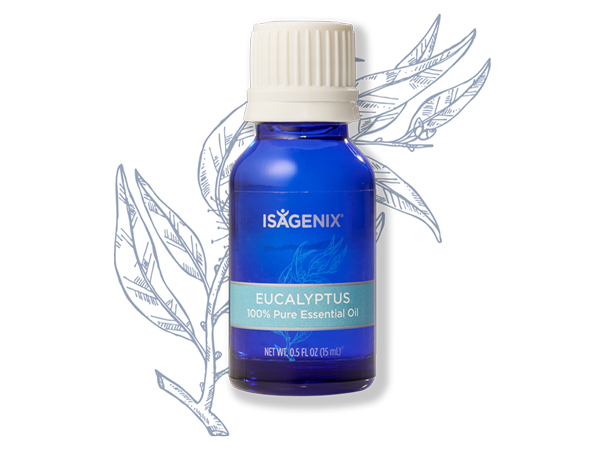 Eucalyptus Oil – A revitalizing oil that may help relieve cold and cough symptoms when used topically. When diffused, it is thought to help clear nasal passages, open airways, and relieve tension headaches. Peppermint Oil – If an energy boost is what you need, put 8 to 10 drops of this beloved oil in your diffuser and be prepared for an uplifting experience! Well-known for its stimulating properties, peppermint oil is ideal for supporting mental clarity. It is also commonly used as a digestive aid, thought to help with a variety of stomach conditions. Tea Tree Oil – Tea tree oil’s natural cleansing properties and fresh scent make it ideal as an addition to DIY cleaning solutions. Although it is not recommended for internal use, it is excellent when added to shampoos and skin care products or when diffused. Frankincense Oil – This ancient oil, sometimes referred to as the king of essential oils, boasts a well-known range of benefits. It is ideal for promoting feelings of relaxation and wellness, supporting skin health, reducing feelings of anxiety, and supporting digestive and cellular performance. DefenseShield – DefenseShield features an invigorating, uplifting aroma and a potent blend of essential oils designed to fight free radicals and support healthy circulation. Airway – Eucalyptus, peppermint, lemon, lemongrass, tea tree, thyme, grapefruit, and rosemary essential oils come together for an uplifting aromatic experience. Airway is not recommended for internal consumption. Content – This aromatic blend of botanicals including lemongrass, cinnamon bark, and eucalyptus helps support weight loss efforts. It is ideal for use with Shake or Cleanse Days. TumBliss – Crafted from several essential oils, TumBliss is carefully crafted to support emotional wellness and promote feelings of confidence and mental clarity. Its minty, refreshing aroma is delightful when diffused. In 2014 I joined the Isagenix business and have never looked back. Network marketing is the most exciting industry on the planet; not only do I get to sell products I feel passionate about, I also help others achieve their own business goals. Every day I am thankful that I took the plunge and joined this exciting industry! I’m now firmly in the $750K club by amassing over $750,000USD in Isagenix earnings since I joined the program**. Unfortunately they don’t hand out these cheques anymore, but this was me in 2016 when I joined the $250K club. Isagenix Associates are independent distributors who sell and distribute Isagenix products directly to consumers, while working to build a support network of additional associates and loyal customers through word of mouth and relationship referrals (known as network marketing). Network marketing has a HUGE number of self-made entrepreneurs with incomes of $100,000 or more. Your opportunities to make money as an Isagenix Associate are limitless! Get ready for an invigorating experience with the power of eucalyptus essential oil! 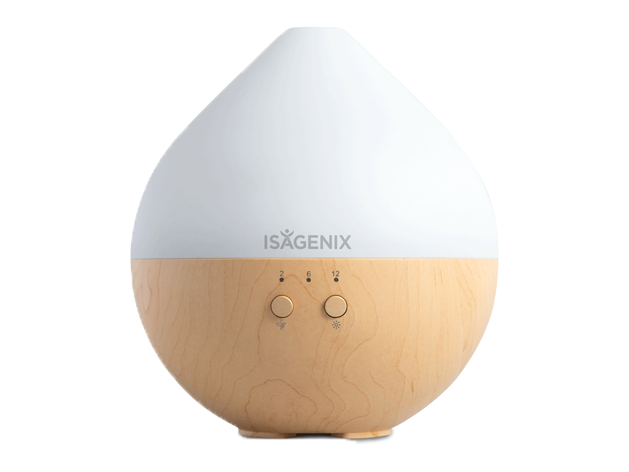 Fill your house with a burst of invigorating, natural freshness using the Isagenix Cool Mist Diffuser.